At the core of this installation is a WiFi router. WiFi routers periodically transmit so-called beacon frames to report the presence of a wireless network to possible receivers of that network. This is similar to how a lighthouse is sending out its light signals. The signals sent by this WiFi router are in the 2.4 GHz range. A radio frequency receiver is used to pick up these frequencies. With the help of a modular synthesizer (with a clock divider, VCA’s, and ADSR’s) and audio amplifiers, the signal of the router is transformed into an electric current, which is sent to three loudspeakers and a subwoofer. Another loudspeaker is placed on the table next to the WiFi router and connected directly to the RF receiver. When I asked him about the function of this fourth loudspeaker, Kristen told me that this allows the visitor to see the movements of the mechanism which is the same as the speakers that vibrate the radiators and door. 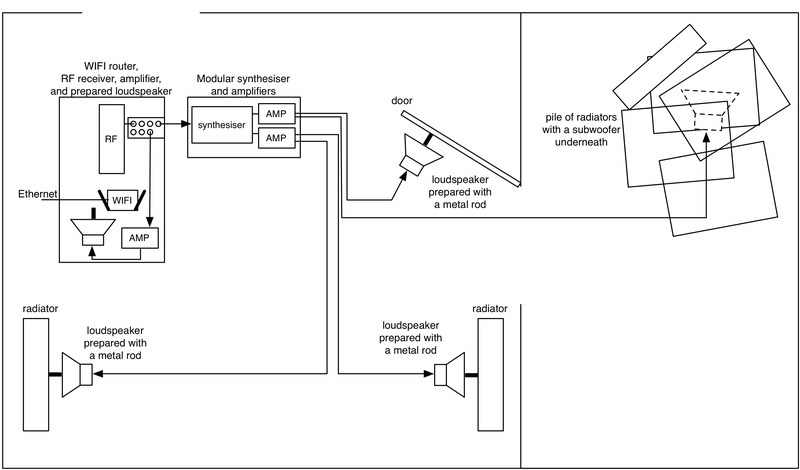 Overview of the set-up for Acoustic Radiator. 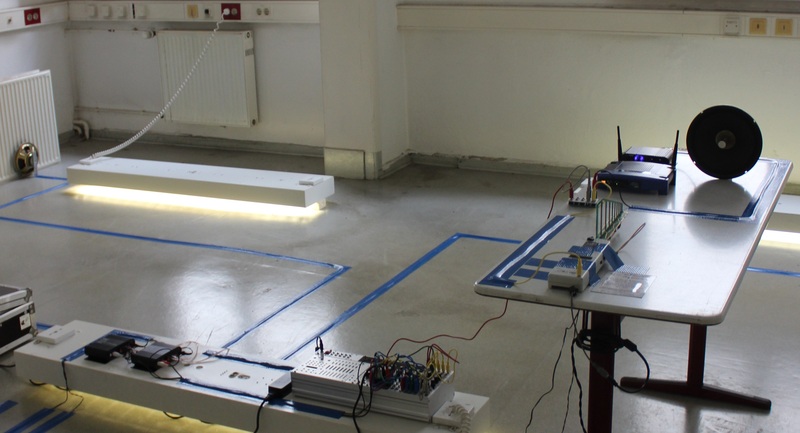 The loudspeakers in this installation are used as a kind of automised percussion player, since they hit objects such as a door and radiators. But this hitting is done not by a single hit but with many vibrations, causing the radiators and door to vibrate much more variably than it would when just hit once. As Kristen explained me, he decided not to use common tactile transducers (which he used, for example, in his work Ghost Station) but instead developed his own prepared loudspeakers. He had several reasons for this. 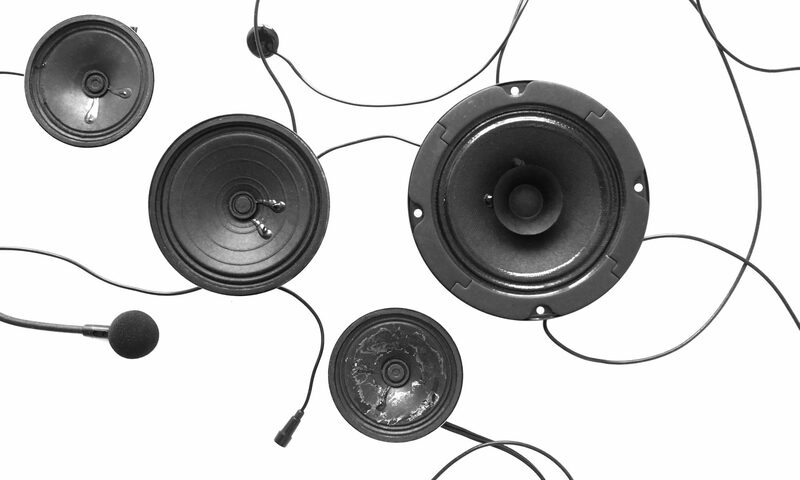 First of all, the installation consists of all kinds of misused equipment, and therefore a misused loudspeaker seemed to be more in place than a properly used tactile transducer. 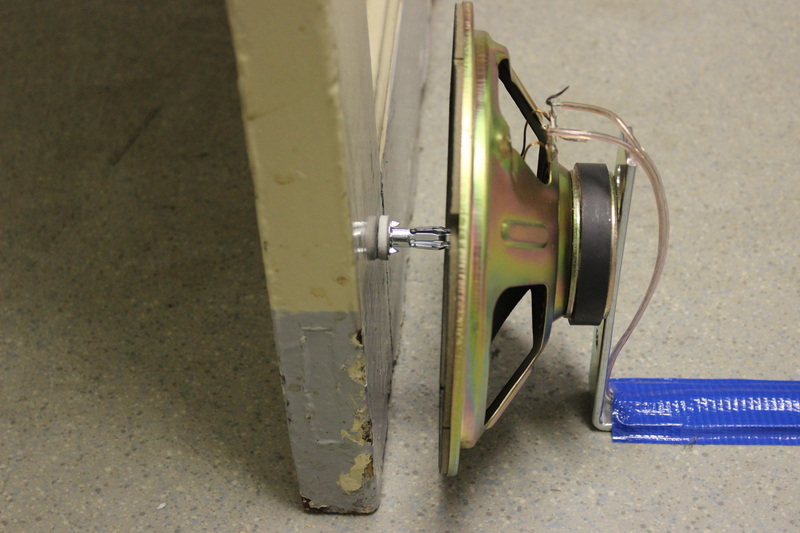 Also, the making of the sound becomes clearly visible to the audience by the vibrating metal rod. Furthermore, and perhaps most significant, the sound can be more precise and subtle, since the felt-covered metal rod is able to transmit the vibrations on to a very specific small spot of the radiators and door. 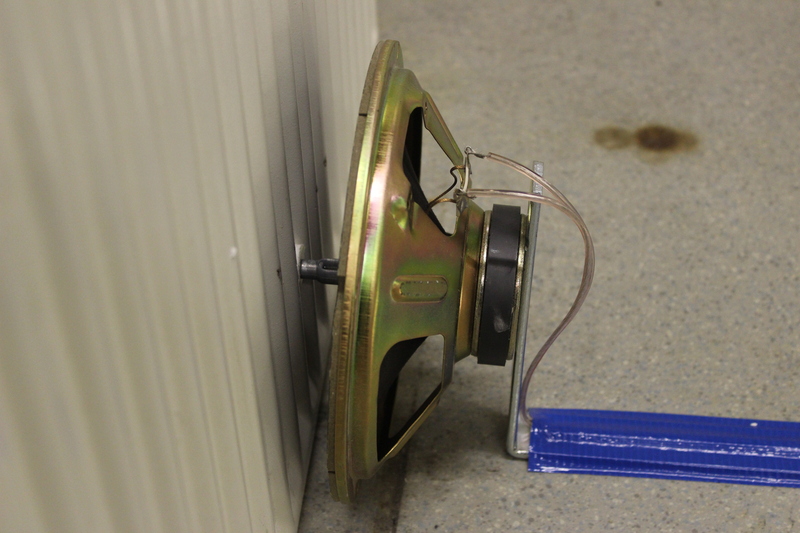 For transmitting the low frequencies, a subwoofer is hidden under a pile of out-of-use radiators. These radiators “radiate” the sonic vibrations of the subwoofer because they will start to vibrate according to the low frequencies produced by the subwoofer. It is through these combination of loudspeakers—the speaker connected to the RF receiver, the three placed close to radiators and door, and the subwoofer—that the signal of the WiFi router is materialised into sound. 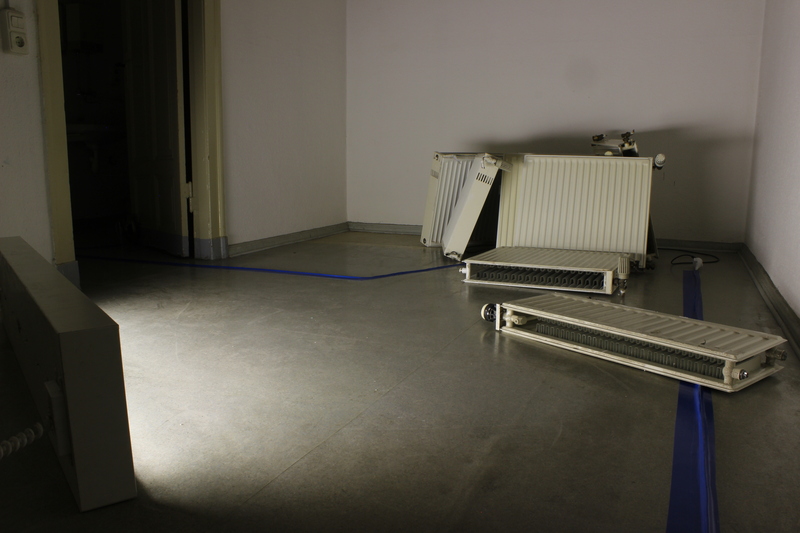 The title of the installation itself is of course a reference to the old radiators used, but at the same time, an acoustic radiator is also another name for a loudspeaker. The direct translation from imperceptible frequencies around the audience members becomes even more clear by the involvement of their own personal devices radiating electromagnetic frequencies. Entering the room, they can connect their mobile phones to the WiFi router. This will result in some glitches in the sound of the installation happening due to the establishment of a new connection between router and mobile phone. 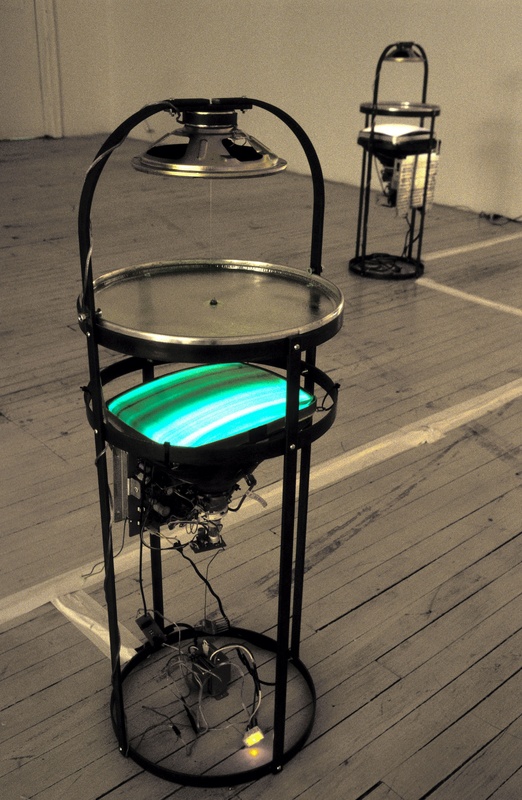 In Transduction (2001), an installation developed together with Dorion Berg, vibrations are once more the point of departure. 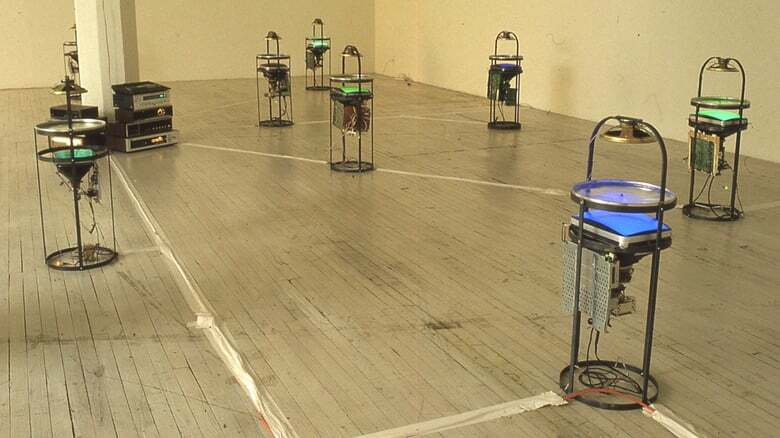 Eight towers, each with a dismantled monitor, a reversed drum skin filled with water, and a loudspeaker are presented in the gallery space. The original electric signal is produced by a drum machine—a Yamaha RX7—with eight different outputs. Each of the loudspeaker-drum-skin-monitor towers is connected to one of these outputs of the drum machine. This electric signal is translated into two different forms of presentation: in a visual form on the monitor and as audible vibrations of a loudspeaker membrane. The loudspeaker membrane vibrations are transduced into another waveform; namely, water waves. 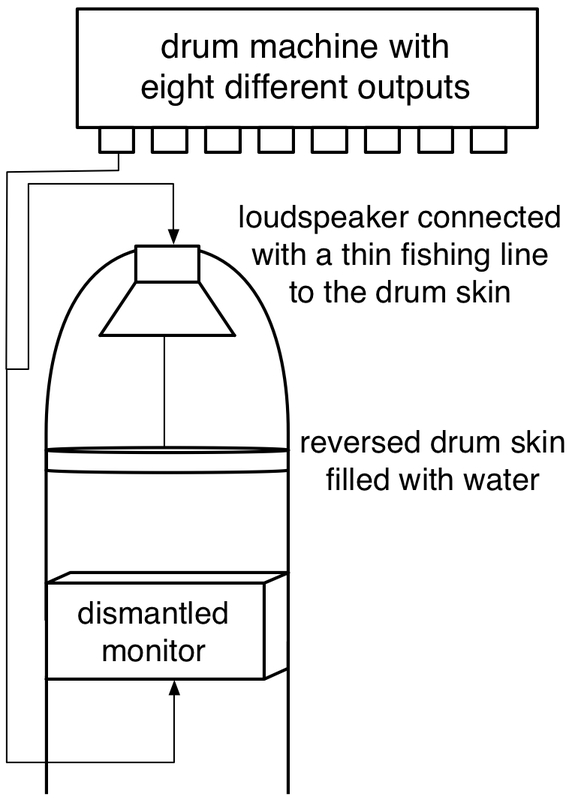 The loudspeaker membrane is connected to the reverse drum skin filled with water by a thin fishing line. In this manner, the vibrations of the speaker are picked up by the drum skin and will gently move the water in a wave pattern specific to the vibration frequency. Since the drum skin is placed directly above the monitor, the water waves break the light of the monitor. In this way the different representations of the same signal meet again, leaving a mysterious impression of their hidden electrical origins. Each of the eight towers contains a loudspeaker, a monitor, and in between, a drum skin filled with water. © Kristen Roos and Dorion Berg. The same electric signal is sent both to the loudspeaker and the monitor.